A year ago, we wrote a short tutorial to show you how to send email using MessageUI framework. 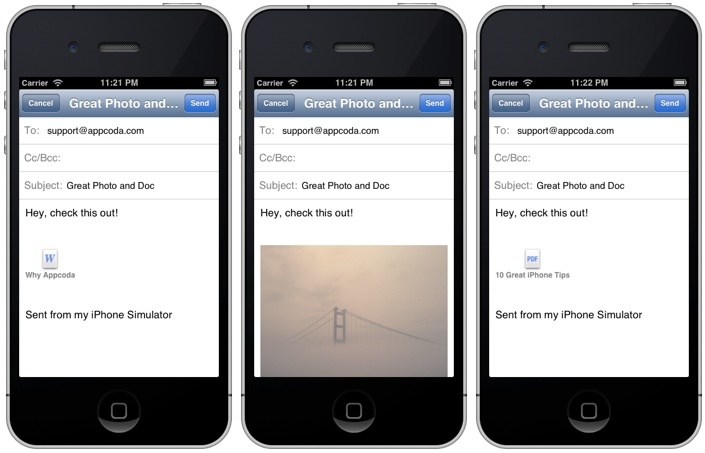 Some asked how to attach a photo, PDF document or Powerpoint in the email. Instead of replying every email individually, we think it’s better to write another short how-to tutorial. The MessageUI framework has made it really easy to send email in your apps. If you’ve read the official document of MessageUI framework, you know the MFMailComposeViewController class already provides a method called “addAttachmentData:” to add any types of files as an attachment. 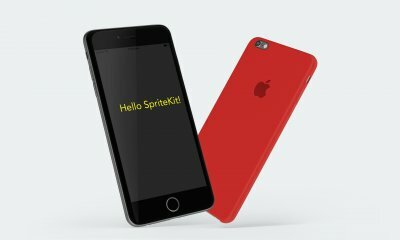 In this short tutorial, like other articles of our iOS Programming 101 series, we’ll write a simple app and demonstrate the usage of the method. As the primary focus is to demonstrate the attachment usage, we keep the demo app very simple. 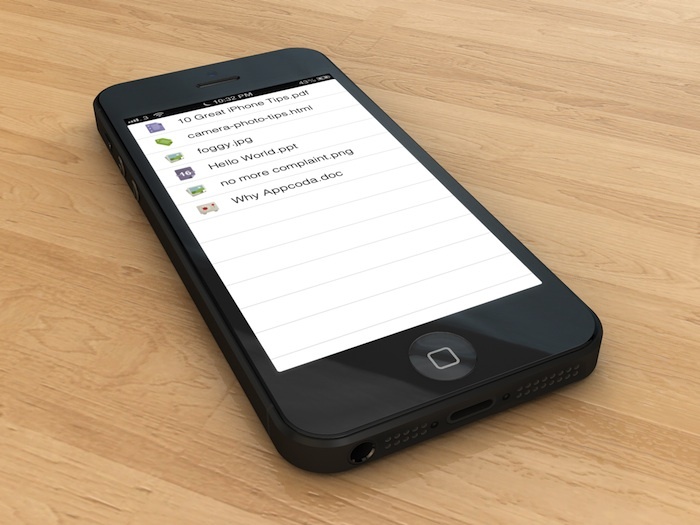 The app simply displays a list of files in a plain table view. We’ll populate the table with various types of files including image in both PNG and JPEG format, Microsoft Word document, Powerpoint, PDF document and HTML file. 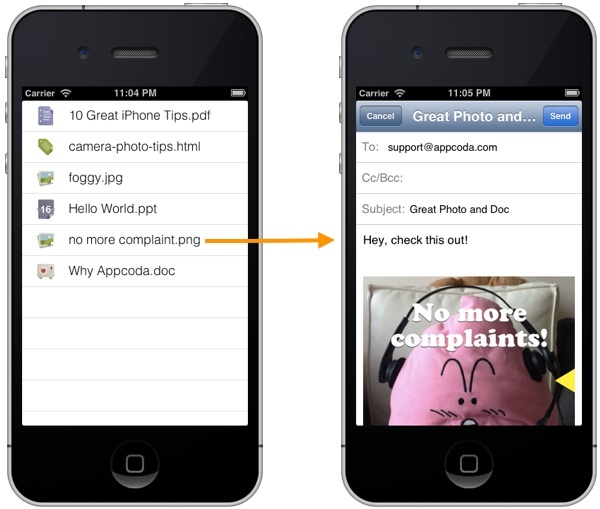 Whenever users tap on any of the file, the app automatically creates an email with the selected file as an attachment. After downloading and extracting the zipped file, you can compile and run the project. The demo app should display a list of files in the main view. Now, we’ll continue to implement the email function. We won’t go into the details of “didFinishWithResult:” method, which is a method of the MFMailComposeViewControllerDelegate protocol that have to be implemented. You can check out this tutorial for further explanation. Okay, let’s go through the “showEmail” method. Line 3-5 of the above code define the email subject, message content and recipients. Line 7 creates the built-in MFMailComposeViewController, which provides the standard user interface for managing the editing and sending of an email message. We populate the fields of that view with initial values including the recipient email, subject and body text. To add an attachment, all we have to do is to call up the “addAttachmentData” method of the MFMailComposeViewController. the data to attach – this is the contents of a file that you want to include. the MIME type – MIME stands for Multipurpose Internet Mail Extensions. In short, MIME is an Internet standard that defines the way for sending other kinds of information (e.g. graphic) in email. Here the MIME type specifies the type of data to attach. For instance, the MIME type of a PNG image is image/png. You can refer to full list of MIME types at http://www.iana.org/assignments/media-types/. the file name – that’s the preferred file name to associate the attachment. Apparently, line 13-36 of the above are used to determine the content of these parameters. We first determine the file path and create a NSData object for that file, followed by nailing down the MIME type. Lastly, we invoke the addAttachmentData method to attach the file. You’re good to go. Compile and run the app. Pick any files and you’ll have an email with the corresponding attachment. For your complete reference, you can download the full source from here. As always, leave us comment and share your thought about the tutorial. If you have any suggestion for the iOS Programming 101 series, feel free to let us know. 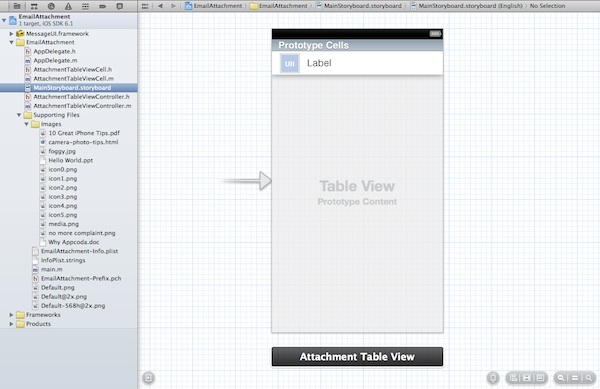 Hey, you can find the image in the Xcode project. how you can find the two picker views in same pages..? HI Simon, how can we create word doc or pdf file in our application and send it as a attachment. Hi Simon, same question as iMac but more general- how can we create a file in our application and send it as an attachment? Are there only certain formats that it can be saved in? I am trying to create a Printer APP, Which will send all the photos and documents to cloud server from my app. My requirement is how to make my app visible to other apps like photos, email, adobe reader to print the documents or photos. For example, if i click print icon from photo or email app i should see my app which will take the email or pic to send it to cloud server for printing. My app will act as printer app but it wont send the documents to network printer instead to a cloud server where it will have direct connection to print servers. This could get wrong result if there is “.” in filename. hi simon , i want attach a video can you address the mime type and limitation of size of the video. What if I want to attach a CSV file to the email for the recipient to be able to open it on excel? From what I read online there isn’t a MIME type for CSV and the default is text/plain text. Will that allow to open it in excel? How can i put browse option to select files from device? Is there anything unique about sending psd files? I have tried this with PSD’s without any luck. I am using the mime type image/vnd.adobe.photoshop (but have tried several others) but no files gets attached. thanks! Hi simon, i am getting info as message sent, but i am not getting any emails in the account that i mentioned in the code.. what might be reason for it..